I blame Labor day for messing up my schedule. But I'm back AND with a yummy recipe. Out of all my meals that I have made, Stir Fry is always a go to and is consistently a once (or twice ;)) a month meal. It was one of the first meals I made for Steve when we were dating. Mostly because it is hard to mess up lol. You can make it with some cut up baked chicken or go all "Veggie" like I did. 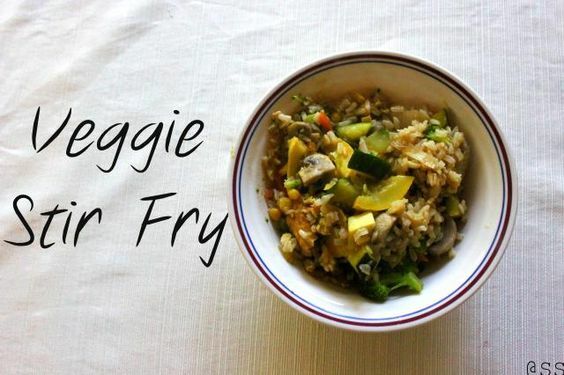 Super simple, easy, and heathy. First things first (i'm the realist.... jk), make some scrambled eggs and set them to the side. till onions start to brown. Then start adding some veggies, giving some time in-between to let the veggies cook down adding some olive oil every now and then to coat the veggies. Next, add the eggs and rice. Then add your sesame oil and soy sauce and mix. The hubby loves when I make this yummy "Yum Yum" sauce with the stir fry. Similar to what you get at a hibachi restaurant. Top with Yum Yum sauce and serve! *BTW unless other wise noted, all veggies used in my recipe's are organic.